What do you get when you combine bohemian tight-knit production and community with tasteful booking? In one of the country’s most aesthetically pleasing settings? CRSSD has already established itself as one of the premier events in the extremely competitive Southern California festival circuit. Taking advantage of the year-round mild climate, CRSSD takes place in the early and latter calendar days of festival season. Since CRSSD’s inception in 2015 they have brought in a crowd and developed a secure following of must-attend fans. In their inaugural year they established themselves by bringing some of the greatest house, techno, and all around indescribable quality artists for a boutique get-to-together. With such artists like Kaytranada, Empire of the Sun, Chromeo, Seth Troxler, Pete Tong, and Maceo Plex on a first-year bill, CRSSD Festival was intent on bringing something different than the atypical festival-norm headline acts. 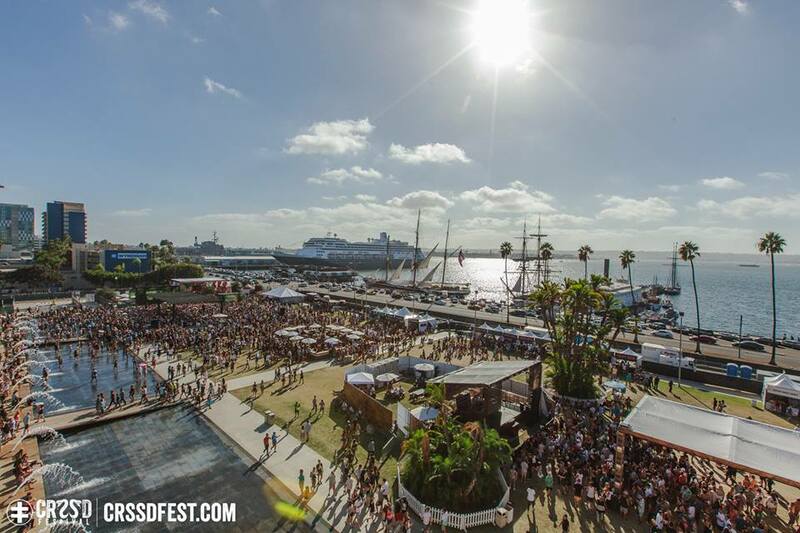 Just when you thought CRSSD was done in the year following the March premier event, they released a two-day fall festival edition. Once again the lineup was stacked with the scene’s coolest and most hip acts like Zhu, a Bonobo DJ Set, and Matoma. For the first two years CRSSD has brought you two well-timed seasonal festivals, and a 2017 Spring edition is already in the works. The latest CRSSD Festival will be taking place once again on the Waterfront Park in San Diego. Clear the dates for Saturday and Sunday March 4 & 5 of 2017 for another gathering of some laid-back like minded people in the presence of some of the most talented artists in dance music. For 2017 CRSSD has brought in one of their most promising lineups to date, including one of the biggest artists to come out of 2016, Flume. Fellow Grammy-noms Bob Moses will also be in attendance, and would a CRSSD Festival really be what it is without a special Seth Troxler b2b set with Eats Everything? 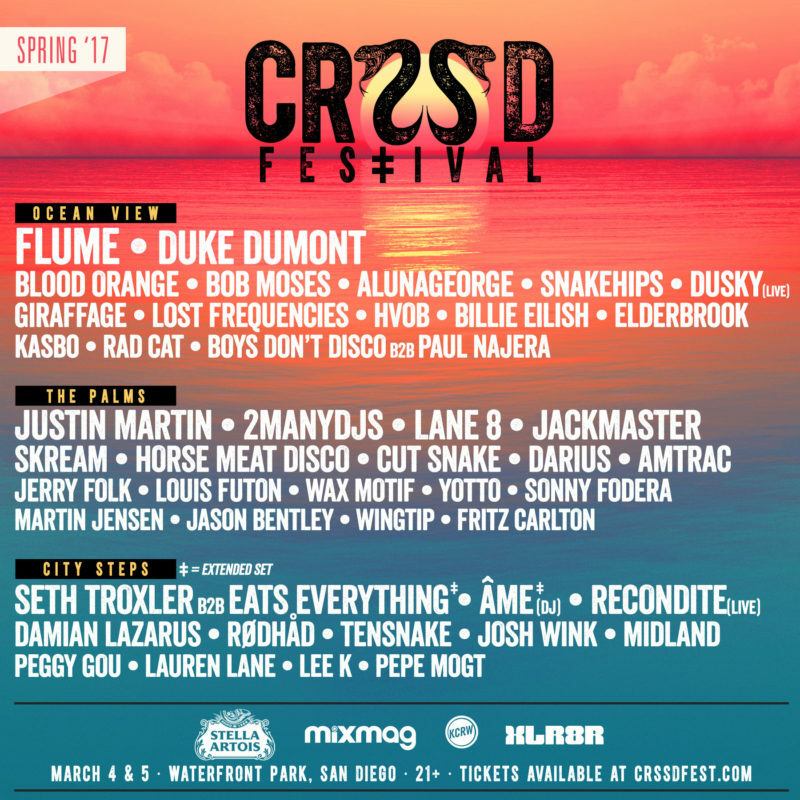 Get your tickets to this year’s CRSSD 2017 Spring Festival HERE.